As is typical for this time of year, one of the local nurseries has its houseplants on sale at 40% off. So naturally, I went to take a look. While this particular nursery always has nice, well kept plants, they don't often have anything particularly unusual or different. The other side, with two more pups. This plant has five in total. Anyway, I'm happy with my new purchase. It has less of a pinkish "blush" than some of the others on the table, but it had five pups on stolons around the center rosette, while the others had between two and four. Between this, and my recently acquired Vriesea splendens, it looks like I'm going to find out if I can handle Bromeliads after all. Pretty! Where did you buy it? I bet it is a 'Fireball,' actually. 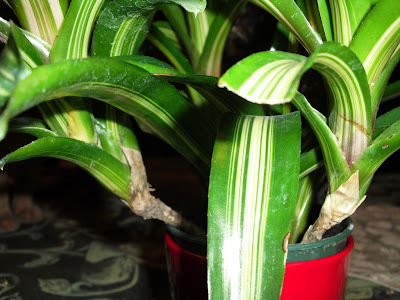 There are a few cultivars, which differ from one another in size and variegation. Failing that, it could be a hybrid of 'Fireball' with something else. 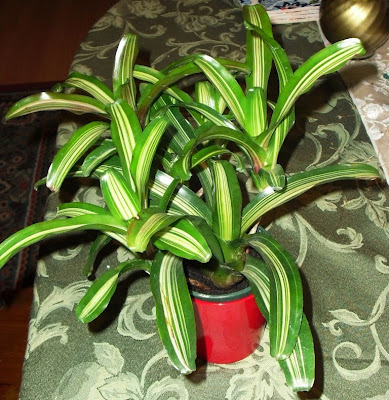 I think there's one called 'Zoe' that looks something like this, though the one picture I have (from a wholesaler in Florida) has 'Zoe' a lot redder than this. Diane: Countryside Nursery in Crystal Lake. Well, with 'Fireball,' it's kind of both: they get red centers when they bloom, but the whole thing will turn a blotchy red in intermediately-strong light, that's not necessarily concentrated at the center of the plant. 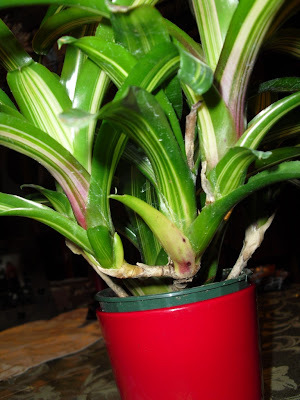 'Fireball' also seems to be an exception to the general bromeliad rule that plants die after flowering: they'll spread, but I have yet to see a rosette die while connected to living ones. I don't know if 'Zoe' is like this or not, but I'd bet that it is.